High-end data centers often need a level of speed that today’s average network cannot provide.The 10GbE solution offered by the N7710-G models makes them ready for the next step in network evolution straight out of the box. Make your NAS into the ultimate multimedia hub! The N7710-G’s HDMI output allows you to connect your NAS directly to your TV for device management. When it comes to data management, Thecus NAS truly let you have it your way. 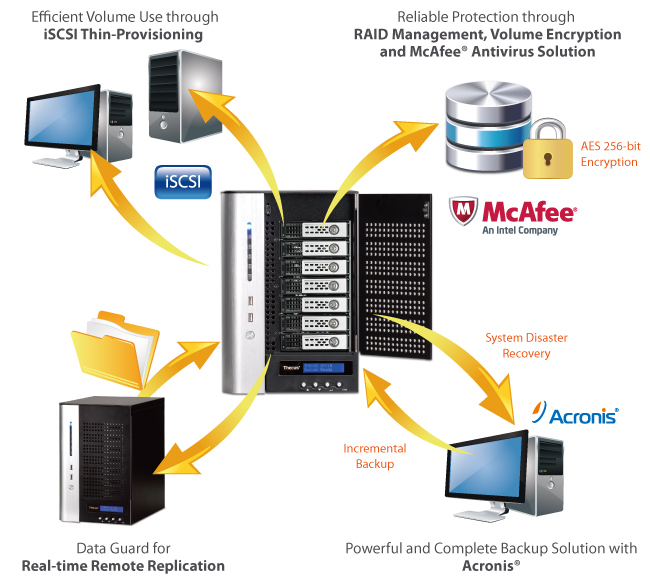 Create multiple RAID volumes each supporting different RAID modes including RAID 0, 1, 5, 6, 10, 50 and JBOD for your own balance of performance and data protection. Should a hard drive malfunction occur, changing one is simple thanks to online RAID migration and expansion, hot spare, and auto rebuild. Thecus N7710-G Diskless with 10GbE PCI-e expansion Installed, iSCSI with stackable feature for expansion.